Successful implementation of robots in welfare services requires that the staff approves of them as a part of daily work tasks. In this study, we identified psychological and socio-demographic determinants associated with readiness for robotization among professional Finnish care-workers. National survey data were collected from professional care workers (n = 3800) between October and November 2016. Random samples were drawn from the member registers of two Finnish trade unions. The data were analyzed with regression models for respondents with and without firsthand experience with robots. The models explained 34–39% of the variance in the readiness for robotization. The readiness was positively associated with self-efficacy, perceived social norms, interest in technology, and perceived impacts on employment. It was also found that the readiness was less determined by age, gender, profession and job satisfaction among the respondents with firsthand robot experience. Among care workers with no experience with robots, older age and lower job satisfaction predicted a readiness for robotization. Care workers stand out as a distinctive group of potential service robot users, with their high confidence in using new technology and low job satisfaction predicting a higher readiness for robotization. Social norms among care workers emerged as an important factor in the readiness for robotization. Care workers and organizations are witnessing a pervasive and ongoing technological change. Care robots are gradually being introduced to care of older people with the aim to optimize and facilitate nursing work and also assist the older people themselves [1, 2]. Due to this development, the staff’s robotization readiness is a crucial factor determining the future care work [3, 4]. Following the distinction between industrial and service robots, care robots are defined by the context of use [5, 6]. Hence, the term care robot refers to a robot performing or assisting in tasks of care . Care robots are typically categorized as monitoring, assistive, social and socially assistive robots—the latter of which refer to more autonomous interaction with people [8, 9]. Care robots today are either very instrument-like or designed mostly for entertainment [1, 2, 10]. However, developments in artificial intelligence foreshadow significant improvements in robotics  and can take care robots to new levels of autonomy and interactivity . A new generation of robots are anticipated to optimize nursing work, a field that struggles with inadequate resources and unergonomic or repetitive tasks [11, 13, 14, 15, 16, 17, 18]. Users will adopt technologies offering the functions that best suit their individual needs . However, social and organizational culture also have important roles in defining the perceived risks and opportunities of new technologies [20, 21]. Social networks and individual change agents and early adopters determine the acceptance of new technologies within organizations . Agency in technological change is associated with enthusiastic technology use, technology-supportive culture, and enabling policies, standards and regulations [23, pp. 122–123]. Care staff’s readiness for change cannot be taken for granted as it varies due to complex individual differences [3, 24, 25]. As acknowledged in change management literature, even before robotization occurs, people already have perceptions of the benefits and risks regarding the change . In addition, it is not simply the amount of technological education received that predicts readiness for robotization but also the degree of self-confidence that the education has established in the individual [26, p. 69]. In this study, we investigated care workers’ readiness for robotization (CRR) before robots are widely implemented in care work.1 We analyzed psychological and socio-demographic determinants associated with CRR and evaluated whether this profile differs whether or not the respondent has prior firsthand experience with robots. Our study is guided by the theory of change readiness [24, 27] and more precisely individual differences in technology change readiness. Readiness for organizational change is defined as an attitudinal mindset where changes, along with new task demands, are perceived as agreeable . Readiness for change is crucial in organizations, given that even when changes are initiated and led by management, they become evident only after they are accepted among the staff . Cognitive factors such as perceptions of self-efficacy and social norms toward the change contribute to staff members’ readiness for change [25, 28, 29, 30, 31], which is reflected in employees’ beliefs, attitudes and intentions regarding the need for changes and in the organization’s capacity to implement those changes . Staff members are expected to be open to occupational changes and possible re-education, yet the importance of a technology-supportive work culture is sometimes forgotten [23, pp. 122–123]. The question is, does the organization truly integrate people and structures in the process of continuous learning and change when preparing for robotization ? Furthermore, have the changes been planned in such a way that employees at different levels have the same opportunities to participate in, say, robot trials? The organizational change proceeds in five stages: precontemplative, contemplative, preparatory, action and maintenance [24, 27]. Robotization in healthcare is currently in the contemplative stage, where people recognize the need for change [5, 33, 34] but have not decided whether to allow it to happen. The nursing field struggles with resource shortages, excessive time pressures and physical strains [13, 15, 18]. On the other hand, robotizing care tasks would mean profound changes in care practices and even the core of the care profession . Moreover, people are especially hesitant in accepting robots as autonomous substitutes for nurses [2, 11]. Because of the contemplative stage of care work robotization, readiness for change is restricted here as an attitudinal readiness for change. A large part of readiness for change is attitudinal in a sense that employees explicitly evaluate the change and this evaluation defines for example the intention to use new technology . In addition to change readiness theory, we refer also to empirical studies that draw from the technology acceptance model (TAM) . Because it centers on usability, TAM is normally intended for studies where technology is introduced to study participants. However, juxtaposing the two theories, we are interested in whether some of the individual explanatory factors from TAM correspond with readiness for technological change. Talking about care robots is not possible without bringing up care itself. Humanity, kindness, reciprocity and empathy are considered to be core values in care ethics, and for any technological change to be approved by care workers, they must be congruent with these shared practice values . Change readiness, too, is considered as a shared psychological state in which employees are confident in their collective willingness and ability to implement the changes [38, p. 1]. One way to measure shared values among potential users is the subjective norm [29, 39, 40]. Subjective norms refer to perceived social norms among important individuals who, in the case of organizational change, can represent either change agency or change resistance in the workplace . The concept of the subjective norm originates in Fishbein and Ajzen’s  theory of reasoned action and has been included in various versions of TAM [37, 42]. In social identity theory, work group norms are defined as standards that are internalized through identification, and they affect a worker’s attitude to the extent that the individual identifies with the group . Hence, group norms determine personal attitudes. The subjective norm differs from social identity theory in that perceived norms can modify personal attitudes in either direction . According to this theory, nurses could therefore either adopt or resist technological change based on their perception of peer endorsement. However, empirical studies show quite consistently norms being shared and not rejected. Subjective norms have been found to influence resistance to technological change  as well as technology acceptance [21, 29, 45]. Especially in studies applying TAM, social influence is an important determinant in assessments of technology’s usefulness . Self-efficacy is another key construct explaining change readiness. It is divided into general and domain- or task-specific self-efficacy. General self-efficacy denotes individuals’ cognitive beliefs in their ability to cope with different and challenging situations [46, 47, 48]. The self-efficacy model is based on social cognitive theory, where behavior is not seen merely as a mechanical consequence of environmental factors and motivators but as a process where behavior, personal factors and environment dynamically shape one another. Even a person’s own behavior influences their other behavior. In social cognitive theory, the predictive power of each dimension—behavior, personal factors and environment—is always dependent on the individual and the context [47, pp. 18–24]. Moreover, because of the dynamic nature of interplay between the dimensions, causality is difficult to both generalize and to time. Bandura has hence asserted that the theory can be applied without considering all three dimensions in the same analysis [48, p. 6]. Self-efficacy is one of the personal factors predicting behavior. By motivating emerging change, self-efficacy is most relevant in the contemplation stage of organizational change [31, 47, 49]. In addition, the self-efficacy model has been considered to be suitable for studying nursing work . According to Bandura, past experiences and potential future accomplishments are the most important factors strengthening an individual’s self-efficacy [46, p. 205]. As current behavior influences future behavior, strong self-efficacy in one domain is generalized to other potential domains . Employees who feel generally self-efficacious adapt to novel environments during organizational changes . Care workers with higher self-efficacy regarding changes in their work tasks also report higher readiness for the organizational change . Although general self-efficacy has been positively related to change readiness [31, 52], the predictive power of self-efficacy is most accurate when determined by domain- or task-specific measures rather than general measures . Technology-specific self-efficacy indicates individuals’ confidence for learning and mastering a certain form of technology [29, 54]. Technology-specific self-efficacy correlates with technology acceptance  and readiness for organizational change [28, 56], yet to the best of our knowledge there are no studies focusing on care work and emerging robotization. In a study of computer-use self-efficacy, supportive and encouraging organization culture predicted workers’ decisions to use computers, and this relationship was moderated by computer-use self-efficacy . Bandura has illustrated the dynamics between individual self-efficacy and social environment by using a concept of collective self-efficacy. Applying to organizational change, collective self-efficacy refers to staff members having a shared view of their capabilities to organize and execute change implementations . Concepts of job satisfaction, fear of employment and organizational participation have also been previously identified as predicting change readiness. The more that employees report job satisfaction  and the less they report fear of unemployment , the more they seem to show readiness for organizational change. There is also qualitative evidence of an association of consensual adaptation with the successful use of technology [57, 58]. In the case of the contemplation stage of technological change, we see the relevance in employees’ participation in planning and implementing equipment purchases in their organization. In addition to the psychological factors associated with readiness for technological change, there is some evidence of prior experiences and general interest in technology leading to a higher acceptance of different technological applications such as computers  and robots [60, 61]. Firsthand experience with robots correlate strongly with evaluations of robots’ pleasance and trustworthiness . Similarly, young age, male gender, and high education have been shown to correlate with robot acceptance . An organizational culture that embraces change and learning predicts job satisfaction and motivation to engage new tasks among employees . Some staff members have the opportunity to participate in planning or piloting new ways of work, thereby gaining experience and having the opportunity to increase their self-efficacy beliefs . Other studies, however, imply that individual factors, such as efficacy or social norm beliefs, lose their predictive relevance after people have firsthand experience of a new practice [21, 31, 47, 49, 66]. This is especially plausible in the robotization context, since people have varied mental representations of robots . Many people have only indirect experience of robots from the media or co-workers, and their opinions can hence be understood as vague or ill-informed . Indeed, people do tend to trust more in information they have discovered themselves . 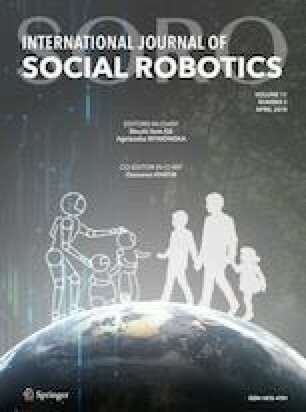 We argue that once care workers have direct experience with robots, this firsthand information alone most predicts robotization readiness, surpassing socio-demographic differences and even differences in self-efficacy and perceptions of social norms. Robot-use self-efficacy correlates positively with CRR. Subjective norms that are accepting toward robots correlate positively with CRR. Individual factors determine CRR stronger among the respondents without firsthand experience with robots compared to respondents with such experience. The hypotheses were tested by conducting surveys of robotization readiness in a presentative sample of Finnish care workers. Survey data of care workers were collected in October–November 2016. The first sample was randomly selected from the members of The Finnish Union of Practical Nurses, who were currently working with older adults (n = 2218). Every other individual in the population was chosen for sampling with an equal likelihood of selection. Participants were aged 17–68 (M = 45.5; SD = 12.1), and 89.8% were female. The response rate was 11%. The second sample was collected from The Union of Health and Social Care Professionals in Finland. The sample included every nurse and physiotherapist currently working at older adults and homecare services, and every third, randomly selected nurse and physiotherapist working at a health center or a hospital. This sample comprised mostly female (89.0%) nurses (n = 1701) and physiotherapists (n = 81) aged 19–70 (M = 47.5; SD = 10.4). The response rate was 9%. Online questionnaires for both samples were identical and included multiple-choice questions about personal and occupational details, experience with robots, and attitudes toward technology in general and robots more specifically. Respondents who completed the first page of socio-demographic information and a question concerning interest in technology were included in the final aggregate data (n = 3800). The division between practical (64.9%) and registered (35.1%) nurses in the aggregate data corresponded with the division of practical (64.7%) and registered (35.3%) nurses in the population of Finnish care workers . In this respect, the data appeared to be representative. However, approximately 25% of the respondents did not complete the whole nine-page survey. The completion rate analysis did not note differences in CRR, occupation or gender between respondents who completed the questionnaire and those who dropped out along the way. However, the dropped-out respondents were on average younger (M = 44.0) than the ones completing the questionnaire [M = 47.3; F(01) 61.19; p < .001]. The definition of robots—taken from the Eurobarometer  questionnaire—primed the questions: “A robot is defined as a machine which can assist humans in everyday tasks without constant guidance or instruction, e.g., as a kind of co-worker helping on the factory floor or as a robot cleaner, or in activities which may be dangerous for humans, like search and rescue in disasters. Robots can come in many shapes or sizes and some may be of human appearance.” The priming also included two photographs, one of an industrial robot and the other of a Care-O-bot service robot . To measure robotization readiness, we described healthcare-work-related scenarios and asked the respondents to evaluate how comfortable they would be if a robot were to assist them in that work task. The question format, with a response scale from 1 (totally uncomfortable) to 10 (totally comfortable), was adapted from the validated Eurobarometer questionnaire . By the combination of robot-assisted-care work scenarios, we applied a covert question form to measure CRR. Thus, we rejected the idea of using direct questions where the respondents would assess their own readiness for such change. This strategy was rationalized first by the abstract nature of change and second by the need to minimize the response bias that could arise from motives regarding personnel policy and robotizing work . The scenarios included 13 potentially robot-assisted tasks, which focused mostly on care of older people. Robotic surgery and robot cars were excluded from the study. Descriptive statistics are presented in Table 1. The items are in the order of presentation in the questionnaire. Full-length question forms are in “Appendix”. The composite variable (range 13–130) was returned to its original scale from 1 to 10 (M = 6.59; SD = 2.19; α .933). Experience with robots was investigated by asking whether the respondent had used robots in different contexts: home, care work, other work and somewhere else. A composite variable formed a scale from 0 to 5. Slightly more than 13% of the respondents had any firsthand experience with robots (Mo = 0; M = 0.15; SD = 0.42). Robot-use self-efficacy in care work was measured with a 3-item scale, including questions of confidence in learning robot use, confidence in learning robot programming and confidence in guiding others in robot use . The responses were given on a scale from 1 (totally disagree) to 5 (totally agree), with a higher number indicating higher self-efficacy. The composite variable (range 3–15) was returned to its original scale from 1 to 5 (Mo = 5; M = 4.19; SD = 0.77; α = .852). To control for general self-efficacy, a six-item GSE-6 questionnaire was used in the analysis . The responses were given on a scale from 1 to 4, with a higher level indicating higher general self-efficacy. The six questions were summed as a composite variable (range 6–24) and returned to its original scale from 1 to 4 (M = 2.45, SD = 0.73; α = .935). The subjective norm was measured by three statements adapted from Ajzen’s model  and formatted to care robots: (1) “The community I work in is mostly welcoming in regard to using care robots”, (2) “Utilizing care robots would arouse considerable objections among the employees”, (3) “My colleagues are enthusiastic about the possibility of using care robots”. The responses were given on a scale from 1 to 5, and after equalizing the scales, a higher number indicated a more positive subjective norm toward robots. The composite variable (range 3–15) was returned to its original scale from 1 to 5 (Mo = 3; M = 2.52; SD = 0.75; α = .828). Job satisfaction was measured with a question: “I consider my job to be pleasant and interesting”. The responses were given on a scale from 1 to 4, with a higher number indicating higher job satisfaction (Mo = 3; M = 3.33; SD = 0.63). This form of question has been used in broad Nordcare surveys for nurses. Single-item measures of job satisfaction are considered sufficient when used as one of the explanatory variables . In addition, an item measuring the lack of participation in the organization’s assistive equipment purchases was used as a predictor. Over one-third (39.8%) of the respondents reported not being involved in any of the assistive-equipment purchasing processes (from planning to implementing). To measure the perceived impacts on employment, we used the statement: “Robots steal people’s jobs”. The responses were given on a scale from 1 (totally disagree) to 5 (totally agree) (Mo = 4; M = 3.15; SD = 1.12). The question was copied from the Eurobarometer questionnaire of repeated measures . General interest in technology was similarly measured with a question modified from Eurobarometer: “Are you very interested (3), moderately interested (2), or not at all interested (1) in technology and its developments?” (Mo = 2; M = 2.07; SD = .49). We also considered an explanatory variable of technological education, but it proved to be an insignificant predictor. As socio-demographic variables, we added age (range 17–70; M = 46.50; SD = 11.30), gender (94.6% women) and profession of the respondent to the analysis. Approximately 56% of the respondents were practical nurses, and 34% worked either as registered or head nurses. During the analysis, the profession was later dichotomized into practical nurses and other, higher-education employees. A plan to use the respondents’ managerial status and working years was withdrawn, as they did not add to the models as significant predictors. Descriptive findings are presented as percentages, means (M), modes (Mo), standard deviations (SD), and correlations (r), along with t-tests, Chi square tests (χ2) and variance analysis (F) for group comparisons. To carry out a profile of CRR, it was necessary to choose several explanatory variables for the regression analysis, yet to constrain the amount to prevent collinearity. Linear regressions are presented in two models: respondents who have never used robots, and respondents who have used a robot in at least one context. Regression tables present unstandardized (B) and standardized (β) betas, standard errors (SE) and the predictive power of the models (R2). Models were tested for potential problems with multicollinearity and heteroscedasticity of residuals. Fisher’s Z test was performed to test the difference in predictive power between the models (adjusted R2 values). Post hoc analysis included inspecting any interactions between explanatory factors. Respondents who reported having direct experience with robots in some context had a higher CRR (M = 7.14; SD = 1.97) than those who had no experience [M = 6.50; SD = 2.22; F(1) = 31.60; p < .001]. There were also differences between occupational groups [F(4) = 21.69; p < .001]. Dunnett’s T3 post hoc test revealed that the difference lay only between practical nurses (M = 6.28; SD = 2.24) and the other occupational groups (M = 6.90; SD = 2.07). As practical nurses reported significantly less CRR compared to other care workers, occupation was dichotomized to practical nurses and other occupational groups for the regression analysis. Those with direct robot experience were more often involved with assistive equipment purchases (χ2 = 10.02; p < .005). Participation in assistive equipment purchases did not, however, correlate with CRR, general self-efficacy or robot-use self-efficacy. Correlations between scaled variables are presented in Table 2. In the regression models (Table 3), 34–39% of the variance in CRR was explained by the independent variables. Fisher’s Z test confirmed that the chosen independent variables worked equally well for both experienced and non-experienced groups (p = .171). Robotization readiness associated consistently with respondents who reported interest in technology, had high robot-use self-efficacy and who did not believe there is a robot-rejecting norm in the workplace or that robots are stealing jobs in general. Robot-use self-efficacy was the best explanatory variable for CRR regardless of whether the respondent had firsthand robot experience or not. The care workers reported high self-efficacy in using robots as assistants. A clear majority (87.2%) of care workers felt confident in learning to use care robots in their work (Mo = 5; M = 4.28; SD = 0.83). The respondents were almost as confident in their ability to guide others as in using care robots (Mo = 4; M = 4.14; SD = 0.88) and even in learning to use robots on a programming level (Mo = 4; M = 4.16; SD = 0.91). According to Bonferroni’s post hoc test, both registered nurses (M = 4.25; SD = 0.72) and head nurses (M = 4.39; SD = 0.64) were significantly more self-efficient than the practical nurses (M = 4.13; SD = 0.80). General self-efficacy was controlled in the regression analysis and did not invalidate the association between CRR and the specific robot-use self-efficacy. The subjective norm and CRR had a similarly consistent relationship in both of the regression models. The respondents who felt that there is not much resistance toward robots in the workplace reported higher readiness for robotization. Interactions between explanatory factors were investigated for both models as post hoc analysis. However, statistically significant interactions were not found. Regarding the portion of respondents who had firsthand robot experience, higher CRR was associated with high general and robot-use self-efficacy, low worries about robots stealing peoples’ jobs, perception of an accepting subjective norm toward robots and general interest in technology. Among those with no robot experience, a higher CRR was reported by older and male respondents, who worked as practical nurses, were generally interested in technology, thought that robots are not stealing jobs, were less satisfied in their job, had high robot-use self-efficacy and an accepting subjective norm toward robots. Experience with robots diminished the individual differences in CRR regarding age, gender and job satisfaction. The difference between occupational groups was even more extreme. In the preliminary analysis, practical nurses reported less CRR. However, among respondents who had experience with robots, practical nurses stood out with a higher CRR on average. In a similar vein, those who had been involved with assistive equipment purchases were more prone to see the benefits in robotization. However, the association was significant only among those who had experience with robots. As the most significant interaction between the models, it turned out that robot experience moderated the relationship between work satisfaction and CRR (t = 1.96; p = .050). Lower job satisfaction predicted robotization readiness, especially for those without robot experience. 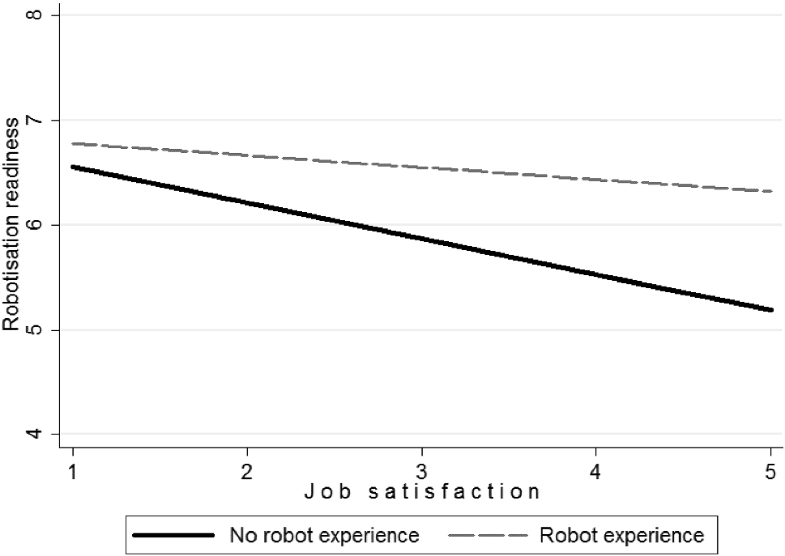 In other words, firsthand robot experience buffered the impact that poor job satisfaction had on higher readiness for robotization (Fig. 1). In this study, we examined care workers’ readiness for robotization  at a time when robots are only just being introduced into care work. Analyzing the individual differences between care workers, we found that CRR is strongly associated with self-efficacy and a subjective norm (i.e., perceived approval of co-workers) toward using care robots. Care workers in our data are confident in their ability to learn how to use new technology. They actually stand out with their extremely high robot-use self-efficacy when compared to those of a prior study of nurses’ self-efficacy using computers . The high self-efficacy and robotization readiness among Finnish care workers add to prior studies of Finnish women demonstrating an eagerness to use information technology and new equipment [74, p. 125]. In line with our first hypothesis as well as with social cognitive theory , contemplation-stage self-efficacy supports an individual’s robotization readiness. However, this was only consistent concerning the specific robot-use self-efficacy. While our results confirmed the importance of technology self-efficacy [28, 55, 56]—now also regarding robots—they did not fully repeat the prior findings of an association of general self-efficacy with change readiness [25, 31, 52]. The correlation between general self-efficacy and CRR was mild to begin with, and in the model with non-experienced robot users, general self-efficacy did not hold any predictive power. Supporting our second hypothesis, we found that if the attitudes towards robots in a work community were perceived as approving, the care workers were more ready for robotization. This indicates first that norms are being shared [20, 21, 29, 43, 45] and second that an organizational culture that supports continuous learning and technology use is important [23, 32, 64]. Our results imply that staff members who are open to new innovations in the workplace spread this attitude in a form of shared norms and eventually heighten the readiness for robotization. Conversely, staff members who resist robots spread a negative attitude and promote a lower readiness for robotization. Finally, our results do not support the interaction between self-efficacy and social norm when predicting technology use  but rather identify robot-use self-efficacy and subjective norm as two separate significant predictors of CRR. The results partly support our third hypothesis while also substantiating prior findings that personal factors play a lesser role in change readiness after the change has occurred [31, 47, 49]. This highlights the importance of direct experience as an explanatory factor. Age, gender, occupation and job satisfaction were meaningful factors for explaining CRR only for those who did not yet have experience using robots. However, the findings were not consistent throughout the models. Interest in technology predicted CRR slightly more significantly with respondents who had experience with robots. In addition, self-efficacy, perceived social norm, and perceived impacts on employment predicted CRR equally well in both of the models. Among care workers who had no firsthand experience with robots, older age predicted higher CRR. This result is inconsistent with TAM studies, where young age predicts more positive attitudes toward robots in the population . This suggests that care workers are a special group of potential users of service robots. It can also be seen as drawing a line between TAM and readiness-for-change models. The negative correlation between age and technology acceptance is sometimes explained by an age-related digital divide and the computer literacy of younger adults (e.g., [75, 76]. However, our model does not indicate robot acceptance but readiness for robotization. In this framework, younger employees may have more to lose in terms of their work being automatized. Further, older employees may be relatively open to changes because they are already more experienced and look for assistive tools that would ease the physical strains of certain tasks. This interpretation is supported by our results, which indicate that males and practical nurses are more welcoming to robots; they fit the profile of care workers who do the most physically demanding work. The results concerning job satisfaction were somewhat conflicting. First, job satisfaction did not correlate with an accepting subjective norm toward care robotization, even though this was implied in at least one prior study . Second, contrary to Lipińska-Grobelny and Papieska , job satisfaction correlated negatively with change readiness. The topic in their 2012 study was a new management system in the manufacturing field , so similarities between the two studies are limited. Care context and the contemplation stage of technological change form a distinctive context for organizational change research. Lower job satisfaction predicted robotization readiness, especially for respondents who did not have direct robot experience. It seems that expectations are high toward care robotics and its potential. However, these expectations do not necessarily meet the reality of robotics today, since those with firsthand experience do not share the same anticipation. According to the change management literature, staff member participation in planning or piloting new ways of working not only leads to new work experience but also increases self-efficacy and determines higher change readiness . Our results do not completely support this. CRR or self-efficacy did not significantly vary between those who had participated in equipment purchases and those who had not. However, the respondents with direct robot experience were more often involved with equipment purchases. In regression analysis, CRR was only higher among care workers who were included in equipment purchases but who also had used robots. Our study describes individual factors found in possible change agents, who are needed in an early stage of organizational change . In addition to an indication of robotization readiness, the results offer an opportunity to consider things from the developmental point of view. For example, supporting the employees in their technology use and self-efficacy is a way to avoid a vicious circle of fear of new technology leading to a rejection of new technology [47, pp. 400–401]. In our data, robot experience correlated positively with CRR and evened out demographic differences. Practical nurses seem to benefit the most from the firsthand information and trials of new technology. In the context of technological change, employees should feel that they are engaged in new ways of work and feel skilled enough to work with the new systems. It is important to include staff at different levels in the planning of new systems and equipment purchases. Study about resigning nursing managers revealed that badly conducted organizational changes is one the main reasons nursing managers leave their job. Implementing changes without the opportunity to collaborate in the decision-making was perceived as particularly difficult . The care worker data included 373 respondents who had firsthand robot experience. Although a relatively large subsample, the data was dominated by those with no experience with robots. Some of the explanatory power lost in the first regression model may be a result of this imbalance. Additionally, in future studies, it would be advisable to cover the quality of the experience, as it is sometimes a more important factor than quantity in regard to forming, for example, self-efficacy [78, p. 135]. Another issue with our data regards causality. In our models, we presented factors influencing CRR, but the dynamic relationship between the variables is acknowledged. The potential people see in robotics can explain their perceptions of, for instance, self-efficacy and how others also think about robots. We wish to also add that robotization progresses fast. This could be seen as a limitation as our data was collected in the fall 2016. However, we believe that psychological mechanism of robotization readiness might stay similar over the time. In this study, we have approached robotization readiness through the lens of cognitive processes such as self-efficacy and perceived social norm. In future studies, effect-related processes should be taken into account as well: factors such as personal and occupational values. For example, religious background and motives can be expected to be good predictors also for accepting robotization in care work . The level of robot-use self-efficacy is notably high in our care worker data. However, we recommend cross-country comparisons to gain knowledge of variation between cultures, since our results can only be generalized to Finnish care workers. Summarizing the results, we have identified key forces in Finnish care workers’ readiness for robotization. Potential change agents are distinguished from others by their high interest in technology, high robot-use self-efficacy, perception that co-workers approve robots, and optimism that robots will not take peoples’ jobs. In addition, regarding staff without firsthand experience with robots, higher readiness for robotization was reported by practical nurses of older age, male gender, and lower job satisfaction. Robotization entails many possibilities in facilitating and modernizing care work. Social cognitive theory explains how individual and collective self-efficacy can result in more effective change implementation. Care workers show remarkably high confidence in learning to use robots in their work. This offers a promising starting point for effective change implementation. In robotizing care work, it is important that the staff have the skills and confidence to make the most of next-generation robots and the opportunities that they present. Among care workers, change readiness seems to be quite contagious, and organizations should strive toward a shared psychological state of welcoming changes that are collectively determined to be beneficial. Statistics of service robots used in different sectors today are reported by the International Federation of Robotics: https://ifr.org/downloads/press/Executive_Summary_WR_Service_Robots_2017_1.pdf. This study was funded by the Academy of Finland (Grant Number 292980). In the last section of the questionnaire are examples of care work tasks, which could, in principle, be done with robots or done with robot assistance. Please rate every scenario by how comfortable you would feel about a robot assisting you with that specific task. Robot assisting in threatening situations.